It is easy to assume that storing a vehicle allows it to rest, and will preserve its vitality. Storing for long periods, however, can actually take a toll on any type of vehicle, even when stored indoors. Taking precautions before storing in our Redlands facility will help you keep your muscle car looking and running at optimal levels. The primary purpose of storing a vehicle in a storage facility rather than at home is to protect it from the elements. At home, your muscle car may be exposed to heat and sun, snow and rain, or animals. Day after day, even under a canopy, the elements can impact vital parts of any vehicle. 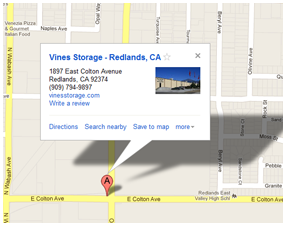 Using our indoor storage in Redlands protects your muscle car from all risks of the elements. Most classic car owners are well aware of the problems that can be caused by leaving existing fuel in the gas tank before storage. Fuel breakdown is one of the major risks of storage, but can be handled easily with the addition of fuel stabilizer and a full tank of gas placed just before entering storage. Other preparations to help protect the engine include a complete oil change, to include filter, and antifreeze. Draining existing oil eliminates any contaminants and gunk like acid that could affect the engine. The oil that is put in to replace that which has been drained should contain corrosion protection. Rust-inhibiting antifreeze added to the cooling system provides protection when the weather turns cold. In our Redlands storage facility, choosing an indoor unit for your muscle car means that cold weather is less of a concern than with outdoor storage. When storing a muscle car, special consideration needs to be given to tires. Optimal radial tires that perfectly complement your car can be expensive. Protect them by removing them or storing your vehicle on jack stands. Hook the battery up to a battery charger. Wash and dry car thoroughly, and apply a coat of protective wax. If using a car cover, choose breathable cloth over plastic types. Apply rust inhibitor to any unpainted metal surfaces. Treat leather, vinyl, and rubber surfaces such as dash pads, seats, and armrests with a preservative to prevent cracking. Place mothballs in a vehicle that will be stored outdoors, and cover the tailpipe to keep critters from entering, or store your vehicle in a cocoon cover. Your muscle car is a valuable asset. Let us help you keep it in its best condition with excellent storage solutions. Contact us today for more information.